The Maya civilisation collapsed around 1000 A.D. 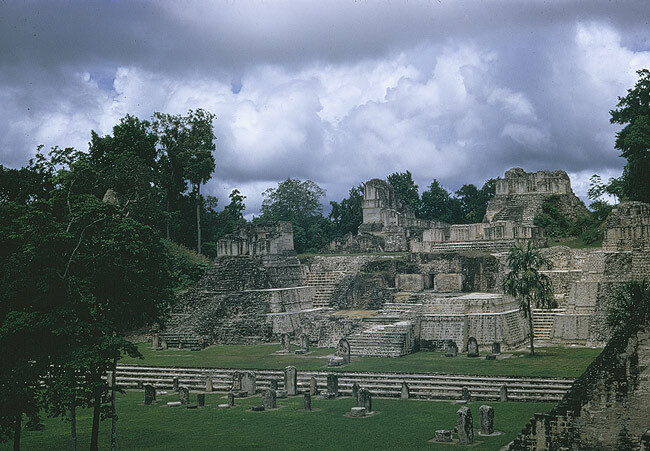 The great city of Tikal thrived in dense lowland jungle of what is now part of Guatemala. The North Acropolis of Tikal consisted of numerous plaster-surfaced stone temples ( eventually numbering more than 100 ) that were built and rebuilt on great stone platforms. The Tikal pyramids include the highest known structure built in the Americas before the arrival of Europeans. Like the pyramids in Egypt, they were built over the tomb of the King of Tikal. The spectacular is impressive. Temple Grand Jaguar is 44m high, Temple III is 55m, Temple IV is 58m.